Original is the signature Caprina formula. The first of all their formulas, it continues to be a favorite amongst customers. All the beneficial properties of fresh goat’s milk are combined with subtle essentials oils derived from natural ingredients. 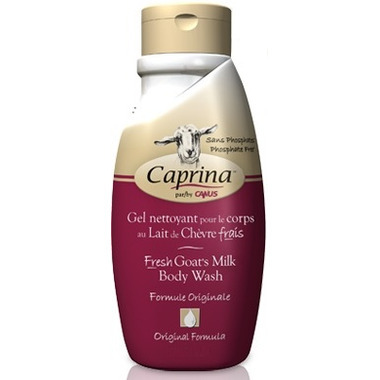 Caprina body wash does not compromise your own skin’s natural protective barrier, and will never dry your skin. Ingredients: Aqua, Sodium Laureth Sulfate, Sodium Lauryl Sulfate, Cocamidopropyl Betaine, Cocamide DEA, Sodium Lauroamphoacetate, PEG-7 Glyceryl Cocoate, Caprae Lac, Glycerin, Polyquaternium-7, Glycine Soja (Maleated), Glycine Soja, Styrene/Acrylates Copolymer, Parfum, Sodium Chloride, DMDM Hydantoin, Methylparaben, Sodium Benzoate, Tetrasodium EDTA, Citric Acid, Benzyl Benzoate, Citronellol, Eugenol, Linalool. I have used Caprina since the day they started,... love their products. This is so gentle , ones skin feels pampered both during and after the shower. Plus, my husband who has very sensitive skin can use it and loves it, too . Love this product, so gentle for sensitive skin. Have my granddaughters hooked on it. Lovely light fresh scent, gently cleanses the skin, leaves skin refreshed & moisturized. An excellent product for everyone in the family. Love the fresh clean scent. Leaves the skin feeling smooth plus my son loves his " goat soap." Love the fresh scent and gentle cleansing of this original body wash.